Ica is known as an area of sand, sea, oases and valleys, the cradle of Peru's Creole culture, saints and medicine men, where the best pisco brandy is distilled and where religious fervor is strong in the worship of the Señor de Luren or the Yauca shrine. The sandy wastes of this area gave rise to major pre-Colombian civilizations, leaving traces that have survived the ravages of time and wind erosion. The desert of Ica was inhabited by great pre- Inca civilizations as Chincha, Nazca and Paracas Culture. The city of Ica was founded in 1536 by the Spanish Jerónimo de Cabrera and was the first city in "Nueva Castilla" (Peru in the Viceroyalty times) where wine and grape liquor were produced, and from this point they were exported to all the Spanish colonies in America. They used the port of Pisco (Ica) to embark the grape liquor, giving origin to the name of one of the most famous liquors prepared in Peru, Pisco. Nowadays the city continues being a very pleasant one, among sand deserts and huarangos (variety of tree) and with a wonderful weather. Ica is recommended as an initial point before visiting the Nazca Lines and the Paracas National Reserve. Las Dunas hotel is the best available hotel in Ica. The hotel has 106 roomy bedrooms: doubles, triples and quadruples including 3 presidential suites with jacuzzi and 1 completely furnished chalet. The rooms have air conditioning, security box, minibar, cable TV and 24-hour room service. Swimming pools, sauna, gym, masaje service, playground, business center, restaurant and a nice bar. Popular with tour groups, corporate events and national tourists. Located just one block from the main square, the hotel has 24 rooms decorated in a rustic, typical and casual style. All of them have private bathroom, hot water (24 hour), cable TV and telephone. The road from Lima to Ica provides the traveler with a variety of attractions. First stop along the way is Chincha, a balmy valley that combines festivals and tradition and which is the heart of a culture forged by the descendants of African slaves brought to work the cotton plantations. Chincha is home to some charming haciendas with a great deal of history. Having the chance to overnight in these unique places makes us feel like stepping back into the 17th century. This charming hotel is located in a converted colonial hacienda dating from 1688. Located in Chincha, between Lima and Ica, it is actually a historical monument in Chincha. The hacienda was a sugar plantation during the colonial era, and was once tended by hundreds of slaves. In 1821, the slaves joined the liberation forces of José de San Martín and the owner fled to Spain. 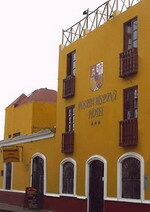 The hacienda has been converted into a beautiful and unique hotel with pleasant, airy rooms, wide halls and galleries, an elegant restaurant and bar. Popular activities at the hacienda include horseback riding, tractor rides, and exploring the hacienda itself, which features a chapel as well as catacombs and underground tunnels thought to once have been used to smuggle slaves. The hotel features the comforts of today with a bar, restaurant, swimming pool, game room, meeting room and secure private parking. On weekends, the hotel offers a special creole buffet. The town of Nazca was founded in 1591 by the Spaniards, on the valley of Nazca, close to towns inhabited by old civilizations that had been dominated by the Inca. Nazca, is a gentle town, slowly developing; in which its main economic activity is based on the agriculture and the trade. Tourism to this area is related directly with the lines of Nazca: discovered in 1927, they are the most extraordinary legacy left by a culture that flourished in 300 BC. The lines are a series of complex designs, some up to 300 meters long which can only be seen in their true dimension from the sky, from an altitude of at least 1,500 feet. The Nazca culture is not believed to have been capable of manned flight. But the question remains as to how they crafted the drawings, what technology they used and what purpose the lines served. The city has comfortable hotels and an aerodrome. This modern hotel built in traditional style, is a haven for those looking for peace and quiet. Located in a unique setting in the desert, outside the town of Nazca, next to the pre-Columbian aqueduct of Cantalloc, the Hotel Cantayo is an owner-operated property boasting a fabulous service and decorated with charm and style. Forty rooms with en-suite bathrooms, air conditioner, mini-bar, security box, king side beds, fouton mattresses, pillows menu, room service, international phone calls, and internet connection. Coffee shops, two restaurants and lounge. Areas for practicing yoga and meditation. Two swimming pools. Souvenir shop. Centrally located, Casa Andina Nasca Hotel is an very comfortable option with all the facilities of the Casa Andina chain. It has 60 hotel rooms (10 non - smoking) equipped with: Private bathroom, cable TV, air conditioning, direct telephone (national and international dialing), hairdryer by request , bathtub and minibar (Superior Queen Rooms), safe-deposit box. Majoro derives from the Quechua words MA = place, and Qoro = thickets, adding them up, it means place of thickets. In 1698 the premises were given to the Saint Augustus Convent until 1910 when it became a private property run until the Agrarian Reform by the aristocratic De la Borda family, who remodeled the old convent into a Casa Hacienda and in the 1980´s into what today is the Hotel Majoro. The hotel is surrounded by 30 hectares of nature and has very fresh rooms, ranging from simples to quadruples. All the rooms are very fresh, they don't require of air conditioning, ranking from simple up to quadruple rooms. This is the perfect place to explore the Nazca Lines. Paracas is a spa, a peninsula, a bay, a pre-Inca Culture and a National Reserve. The spa, starting point for all visits, is located in the district of Pisco, 245 km (152 miles) from Lima, and is a place of gentle beaches and sunny weather most of the year. Very close by is a picturesque creek of fishermen and a residential area with beautiful houses, as the area is a popular high-end summer destination for Peruvian lovers of adventure marine sports. The National Reserve of Paracas is dedicated to the protection and the conservation of marine ecosystems as well as to the protection of the cultural and historical patrimony of the pre-Inca Paracas culture. It is considered as one of the richest and most uncommon ecosystems in the world; declared "World Heritage Site" by UNESCO. Boats depart from the port to the Ballestas Islands), giving visitors a chance to gaze at the sea lion colonies, millions of birds and the famous three-pronged Candelabro (Candelabrum), carved into the sand with a similar technique to the Nazca Lines, although possibly of a different origin. The Libertador Reserva Natural Paracas Hotel is located right in front of the Pacific Ocean, in one of the most impressive natural landscapes of Peru. Perfectly located in an oasis surrounded by gardens and beautiful beaches, it turns into the ideal place to enjoy a pleasant weather and an intense natural life. You will be able to practice outdoor entertainment sports in the fields of racquetball, tennis, mini golf or travel in boats and sand-dealers. Everything is designed for your rest and tranquillity, just relax and enjoy our service. From the Hotel pier you may board the boat to visit the Ballestas Islands. Two swimming pools, open air and covered dining room. Bar. Good food. Due to the serious damage caused to the hotel structures by the earthquake that took place last August 15, 2007, the Hotel Paracas is being rebuilt and is temporarily closed. Reopening is scheduled for 2009, to be confirmed.